My son and I watched the first (and only, so far) season of THE DRAGON PRINCE last week. Co-creator Aaron Ehasz was the head writer and director of Avatar: The Last Airbender, so I was really excited for this. Of course, Avatar was an amazing show, and it’s going to be hard for anything to live up to that standard. 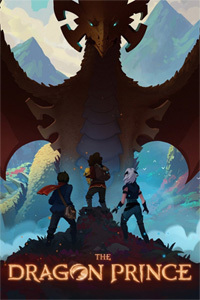 The Dragon Prince might not be as amazing as Avatar, but I still enjoyed it. The show is set in a more “traditional” fantasy world of kings and magic and elves and dragons. It’s a well-developed world, with a lot of history and detail, but there was a lot in the first episode that felt like variations on themes I’d read and watched a lot already. It didn’t feel new. It picks up more with the second and third episodes, as human princes Callum and Ezran join up with the moon elf assassin Rayla to try to save a dragon egg. We also get more character development in general, which is one of the show’s strengths. There’s a lot of humor and banter and fun, but also some genuinely touching emotional moments. I particularly love Rayla’s struggles and conflicts, and moments like when she casually tells Ezran he’s worth losing a hand for. Several people said they thought this was intended for a younger audience than Avatar, but I’m not sure. Avatar had some deep and powerful themes, but at its heart were a trio of young kids. The Dragon Prince doesn’t feel as deep, but it still deals with war and death and corruption and torture. My son spent a fair amount of time drawing parallels between the two shows. (He was asking when the Appa-analogue would show up. Then we got the episode with Ava the wolf.) If you’re a fan of Avatar, some of the humor and characters and conflicts will feel familiar. I think that’s mostly a good thing. But Callum was a little too Sokka-like for me — they’re not only written with a similar voice, they’re played by the same voice actor. My biggest complaint is that it’s too short. The season ends on a nice moment, but with plenty of conflict building on the horizon. Literally. And there’s obviously so much more world building and history to get into. In a lot of ways, season one was just laying out the groundwork and establishing the world and characters. The animation style was a little annoying at times — a bit choppy. It could be striking and beautiful too, but not as much as the artwork in Avatar. Netflix hasn’t officially announced a second season yet, but I’m hoping and assuming they will, and I’m looking forward to watching it. I quite liked it for both the diversity and the cheesy lines (“unstoppable is just another kind of stoppable”). I may have binge-watched the entire season in one night. 😉 Also waiting and hoping for a second season! I didn’t know one of Avatar creators is one of the people behind Dragon prince; that explains the similarity. I drew the same Sokka parallels without any of the background info, so I really hope they do more to differentiate Callum. I did love seeing the half sibling relationship. I was shocked and disappointed at how short the first season was. I thought a lot of the groundwork they laid was really interesting. I am convinced that the mage king swapped the soul of the old king with his pet bird, so the poor king gets to watch the usurper slowly destroy his family and the world. I really liked it as well and pretty much hold the same opinion as you. It left me wanting more, which was nice. There were definitely times where the animation was choppy, which didn’t make any sense to me since the show was CGI, there’s no reason for it unless you were intentionally trying to make the show feel like it’s hand animated.